In spite of cooling measures, Singapore is still the world’s second most expensive property market. Singapore retained the crown for being the world’s second most expensive property market, with the average residential property costing around USD $1,063 psf, behind only to Hong Kong. 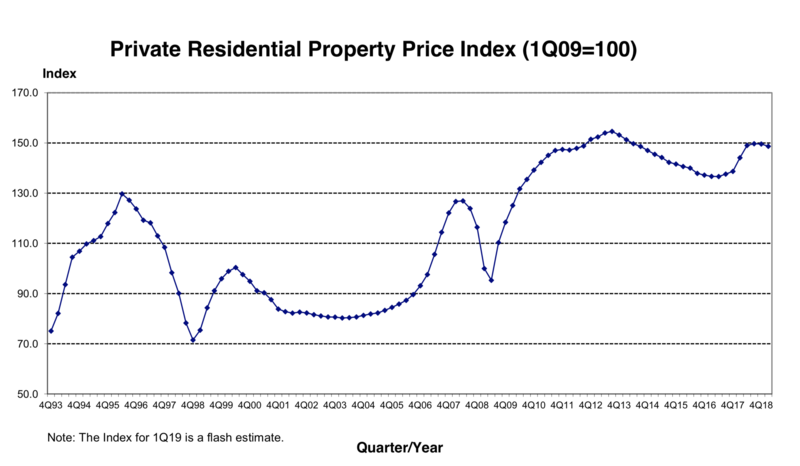 Earlier in the month, Urban Redevelopment Authority (URA) released their flash estimate of Singapore’s private residential property price index for 1Q2019, which fell 0.6% from the previous quarter. Last week, we covered some of the best performing REITs listed on SGX for 1Q2019. For this week, we’ll look at the other side of the property sector: real estate developers. There are around 70 real estate developers and operators listed on SGX, excluding REITs. SGX has released statistics that show the 5 largest, best-performing developers averaging 22% in total return year-to-date (YTD). These stocks are Hong Fok (+34.6%), OUE (+23.8%), CapitaLand (+18.6%), Yanlord Land (+17.2%), and UOL (+16.0%). For this week’s instalment of 4 Stocks This Week, we will look at four of these best-performing property stocks. Headquartered in Singapore, Hong Fok Corporation Limited’s primarily operate in three segments: Property Investment, Property Development and Construction, and Property Management. The company’s investment properties include the International Building at Orchard Road, Singapore, YOTEL Singapore Orchard Road, and The Concourse and Concourse Skyline at Beach Road. Hong Fok closed at $0.905 this week, giving it a market capitalisation of $787.9 million. OUE is a real estate owner, developer and operator with real estate properties located in Asia and the United States. The group also manages and owns a significant portion of two other SGX-listed REITs: OUE Hospitality Trust (SGX: SK7) and OUE Commercial REIT (SGX: TS0U). In addition to the REITs, OUE also owns a diversified base of real estate encompassing hospitality, retail and leasing, commercial and residential properties. Its hotels and resorts properties include Marina Mandarin Singapore and Crowne Plaza Changi Airport. OUE closed this week at $1.80, with a market capitalisation of about $1.76 billion. Yanlord Land is a China-focused real estate developer, which primarily focuses on high-end residential, commercial and integrated properties in strategically selected high-growth Chinese cities, such as Chengdu, Guiyang, Nanjing, Shanghai, Shenzhen, Suzhou, Tianjin and Zhuhai. The company’s Property segment is involved in the development of residential, commercial and other properties, while its Property Investment segment is involved in leasing of properties to generate rental income and benefit from capital in the longer-term. Yanlord also provides property management, ancillary services, advance purchase of construction materials, investment holding and other related services. Yanlord closed this week at $1.49, giving it a market cap of around $2.9 billion. UOL is one of Singapore’s leading public-listed property companies, with diverse exposure to property developments, property investments, hotels and serviced suites. Listed on the Straits Times Index since 2015, UOL has a market capitalisation of more than $6.8 billion. The Group has extensive property development capabilities in Singapore, China and the UK. UOL has a hotel subsidiary, the Pan Pacific Hotels Group Limited, which owns and manages over 30 hospitality properties in globally under the “Pan Pacific” and “PARKROYAL” brands. UOL’s stock closed trading this week at $7.28, giving the company a market cap of more than $6.13 billion.